As the host city of Montreal entered the initial planning stages for the 1967 World’s Fair, Safdie submitted his thesis project as one of the proposed pavilions at the fair. 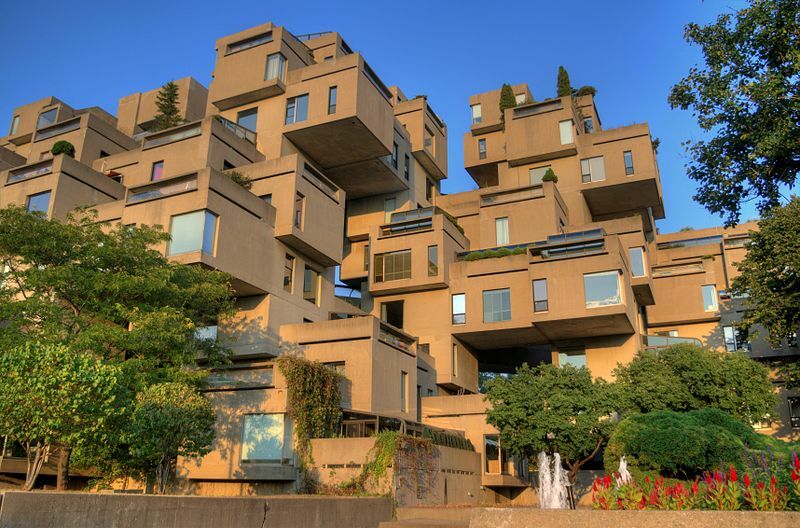 Unbelievably, this unknown neophyte’s proposal was accepted — Habitat 67 was built, and became an iconic symbol of the modern aesthetic at the fair, and a signature Montreal landmark. From its unusual prefabricated construction to its unique cubist design, Habitat was created to be both affordable and comfortable. 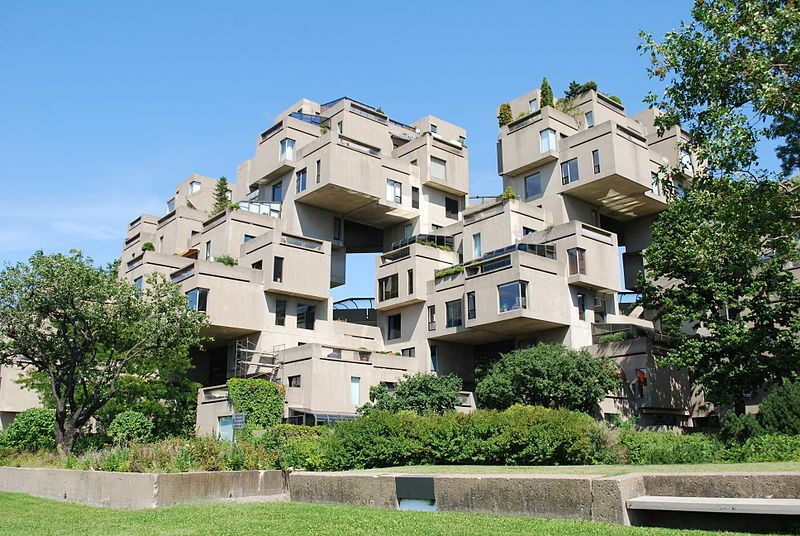 Safdie’s original plans called for a complete community of 1,000 modular housing units, shops, green spaces, and a school. However, his vision was realized in a scaled-down version and contained only 158 residential units. The structure’s distinctive form — a series of set back and stacked cubes — make it possible for each apartment to have its own garden (on a neighbor’s roof), free flowing fresh air from the outdoors, and an abundance of natural light. External walkways allow all residents direct access to their own homes. In an effort to minimize construction costs, the modular units were mass-produced in an on-site concrete factory. Poured over a reinforcing wire skeleton, the concrete was cured to produce a cube. Cubes were then transported to an assembly line where electricals and sub-floors were installed, followed by insulation and windows, and finally prefabricated bathroom and kitchen fixtures. Then each completed unit was lifted by crane and positioned in place. 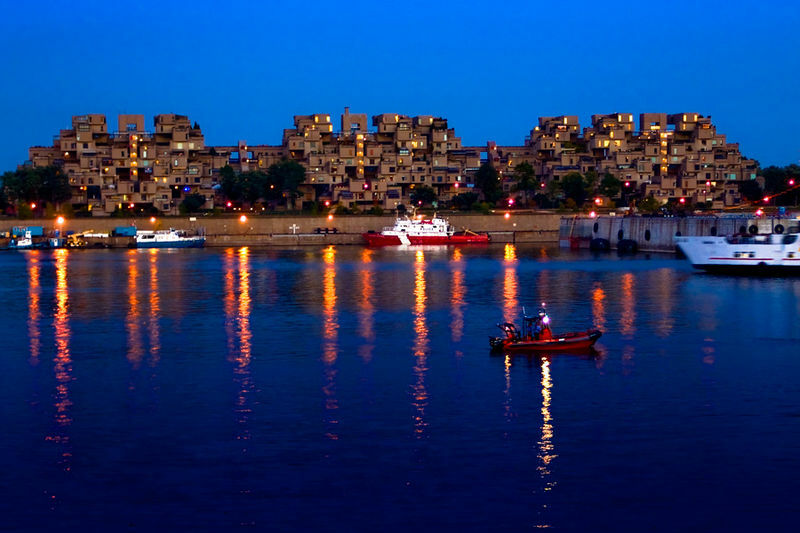 Located on its own peninsula, la “Cité du Havre” on the Saint Lawrence River, Habitat 67 provides spectacular views of the city across the river. Despite the regularity of the prefabricated cubes, Habitat has 15 different configurations of apartments designed to accomodate singles and families of different sizes. In the ensuing years, residents have added their own changes as well. There are now 146 residences in Habitat. 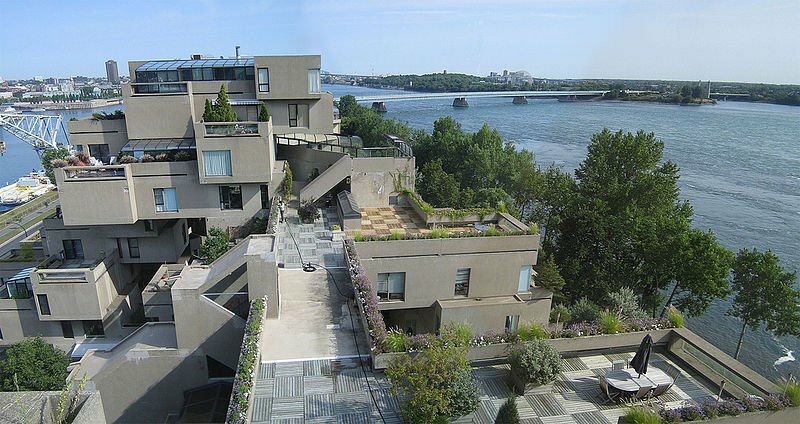 Habitat 67 showed the world that it was possible for dense urban living to include both privacy and green spaces — however, construction costs were not nearly as low as Safdie had originally envisioned. Additionally, the building’s notoriety made living there a somewhat exclusive proposition, and the price tag for apartments soared. But the structure’s open spaces, stunning views, skylights, and suspended terraces are as futuristic-looking today as they were in 1967. 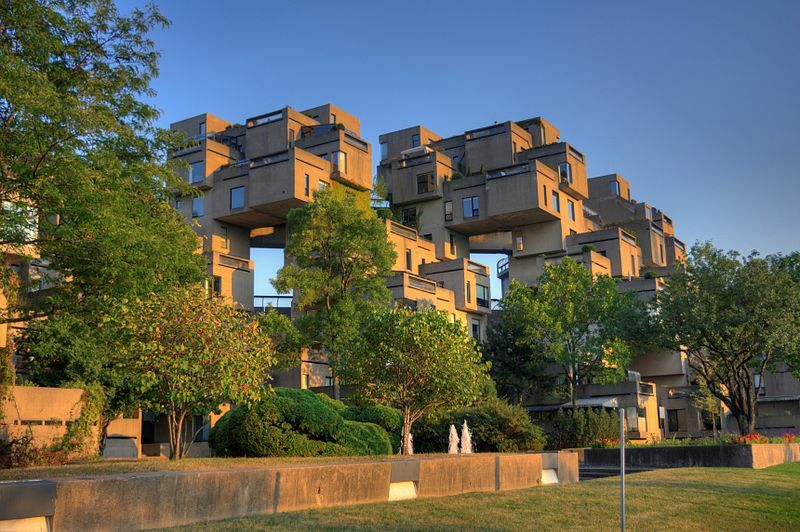 Montreal residents still enjoy the best of urban living within its concrete walls. Built for a more comfortable, more efficient future, Habitat 67 also guaranteed the fame and future of its architect, Moshe Safdie. His thoughtful, innovative designs are now scattered across the world, and he’s been recognized as a master of contemporary architecture. 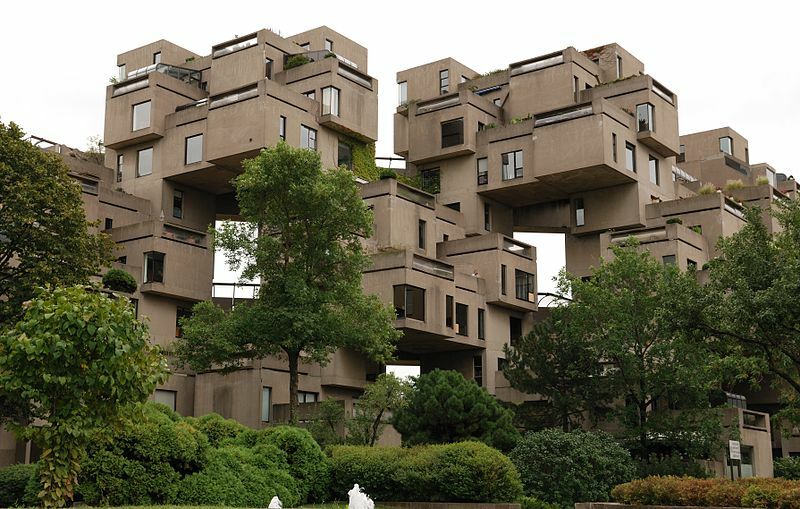 View more of Safdie’s work courtesy of Tablet magazine online.